Each appointed member’s term is for a period of three years and a member may be reappointed. All decisions of the NIRB are decided by a majority of votes cast and are required to have a quorum of members (generally 5 members). All members of the NIRB have a vote, except the Chairperson, who only votes to break a tie. These nine individuals form a unique and independent decision-making body. 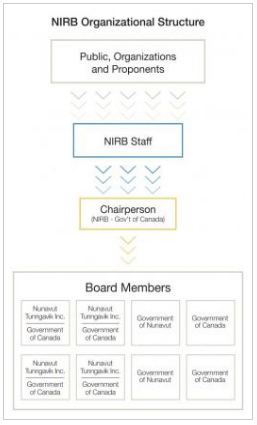 Although they rely upon their Government and Inuit Organization partners for advice and for technical assistance, the members of the NIRB make their decisions on behalf of Nunavumiut (public of Nunavut) and the rest of Canada, and not as agents of their appointing bodies.